You can’t keep a good woman imbued with the power of the entire animal kingdom down. Previously relegated to an animated series companion to the CW’s DC TV-verse, Vixen will be joining the live-action big league when Megalyn Echikunwoke brings the hero to life as a guest star on Arrow. Echikunwoke is the actress who voices Vixen on the CW Seed Vixen animated series, and is so perfect for the role that I have to assume that the CW had a live-action appearance planned for her—or at least optimistically hoped for one—from the start. 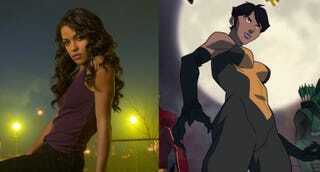 Vixen will make her debut on the 15th episode of Arrow’s current fourth season, which will air on February 24. The question now is this: Is The CW thinking about adding a fourth DC TV show—this time starring a woman of color—to its line-up, or could Vixen be joining the Legends of Tomorrow in that show’s second season? I hope the former, but I can’t deny the idea of Vixen and John Constantine headlining LoT also makes me nerdily giddy, too.